In perfume, the name ‘Poison’ is synonymous with excess, danger and glamour. It’s more than just a family of fragrances – it’s a way of life for those daring women whose answer to the question ‘what’s your poison?’ is only ever ‘DIOR’. This is high-fashion fragrance at its boldest, at its most daring and definitely its most ‘DIOR’ and whilst the franchise may have started in the 1980s, DIOR continues to offer modern interpretations of its olfactory toxicology for the girl of today – the Poison Girl. 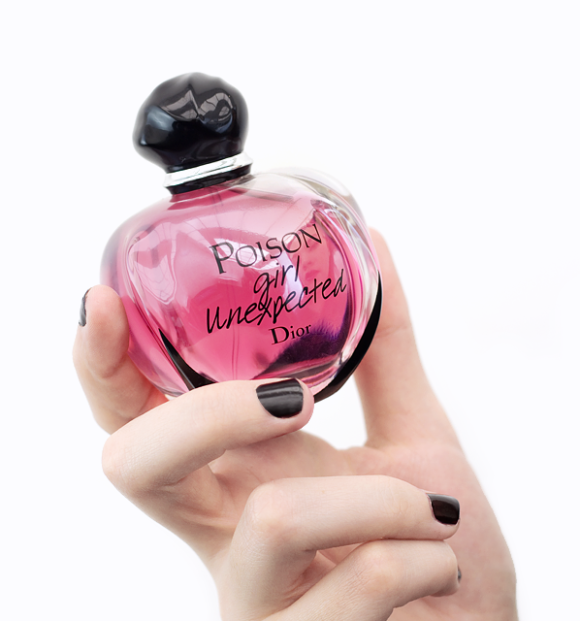 DIOR’s latest fragrance and their latest poison is Poison Girl Unexpected and it certainly lives up to its name. This scent is uncharacteristically fresh and sparkling – a poison that may lure one in with its affable, glittering appearance, but will soon have one hooked with its cerebral rose and delicious dry down. Expect the unexpected and dare to tread without care because Poison Girl Unexpected offers quite the ride. Poison Girl Unexpected opens with a rather surprising, or dare I say ‘unexpected’ shock of ginger, perfumery’s note du jour. The sharp, zesty and aromatic zing of this unusual note blends with the bitterness of blood orange and the refreshing sparkle of lemon to create a bold and blinding citrus accord that literally sweeps one off of their feet. With this distinct citrus impression Poison Girl Unexpected makes a statement the second it appears out of the bottle but rather than demanding attention with shocking flowers et al, the unexpected statement here is made by the giant nature of its freshness. The signature at the core of Poison Girl Unexpected is an intense rose note. But rather than presenting a photographic replica of a real rose in nature this one feels as if it has been constructed from unusual materials. The petals, which are usually deep red and velvet-like have the texture of transparent pink vinyl, whilst the green leaves and stems are twirls of paper with an infectious, powdery lightness. The beads of dew that adorn the blooms in nature are turned to light dustings of sugar here, creating an edible rose that only feels like a rose when viewed from certain angles. It is curious and unexpected. In the base, Poison Girl Unexpected is a delectable delight of dulce de leche, with vanilla and tonka bean warmed up by the roasted tones of hazelnut. The woody note cashmeran brings a smooth, silky quality, but also a lightness of hand that stops things from being excessively delicious. Musk, the staple of modern perfumery elevates everything, providing diffusion and smoothness, but also an effervescence that ties the sparkle of that bold ginger-citrus accord to the warmth of the base. The dry down feels like a calm contrast to the invigorating opening and it’s these twists and turns that make this fragrance so enjoyable to wear – one just doesn’t know where it’s going next. Poison Girl Unexpected serves up a unique twist on the modern gourmand rose. It takes the image of a pink rose draped in vanilla and tonka, and turns into something luminous and neon-like. Through a diffusive signature and sharp citrus it adds a veil of transparency ensuring that this vibrant, vivacious composition is never too much – instead, it teeters on the edge in that exciting place where one doesn’t know in which direction things are going to go. Poison Girl Unexpected is a perfume of tension and shock, yes, but it is most importantly fun and carefree, and reminds us that DIOR’s many poisons represent a manifesto for the woman who lives without restraint. This entry was posted on Wednesday, March 28th, 2018 at 9:58 am and is filed under Candy Perfume Boy, Fragrance, New products, Tried & Tested. You can follow any responses to this entry through the RSS 2.0 feed. You can skip to the end and leave a response. Pinging is currently not allowed.